In September 2016 mv Happy Sky has has transported two large STS container cranes from Rotterdam, The Netherlands, to Vigo, Spain. 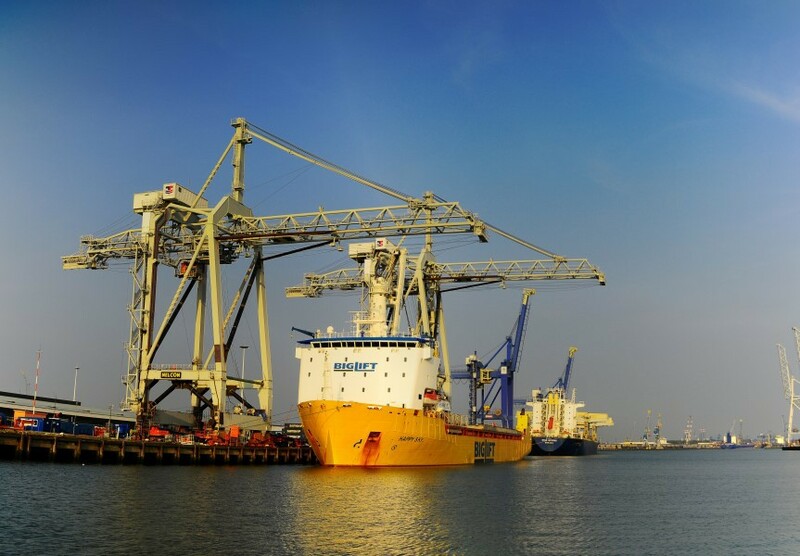 Until 2015, the container cranes served the then Home Terminal of container handling company ECT in Rotterdam. The cranes were sold to Davila Group and will be operated on the Termavi container terminal in Vigo. 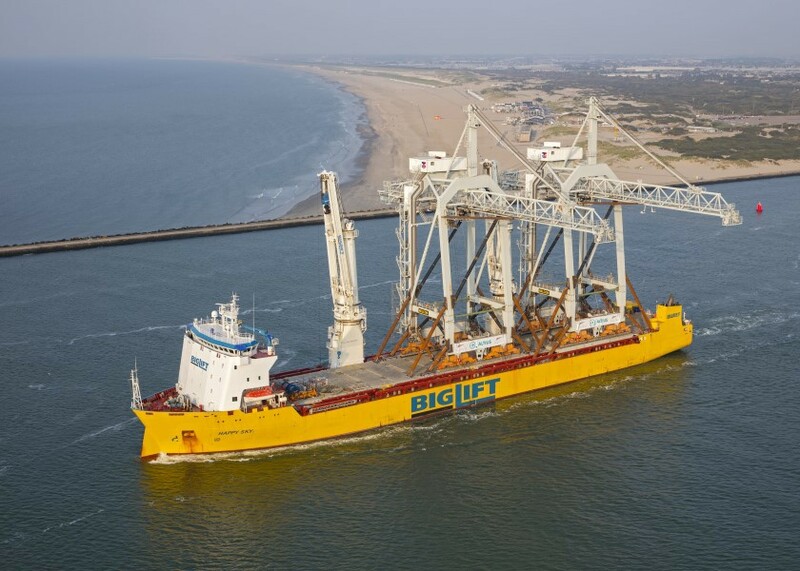 The engineers of both BigLift and client Altius S.A. meticulously prepared for this move with its many challenges. The cranes’ enormous sizes and their large weights required extra attention in an extensive trail of preparation. The cranes are over 60 m high, 86 m wide and 15,25 m between rails. During transport they had an overhang of no less than 58 m in total – 40 m on port side and 18 m on starboard side. The weight of each crane is well over 800 mt. As cranes are not designed to be transported by sea, it was necessary to reinforce them to withstand the accelerations and forces occurring during the sea voyage. A total of 80 mt additional steel was fitted in each crane to strengthen it. As the cranes’ centre of gravity is very high, the lifting operation required cranes with a sufficient lifting height. 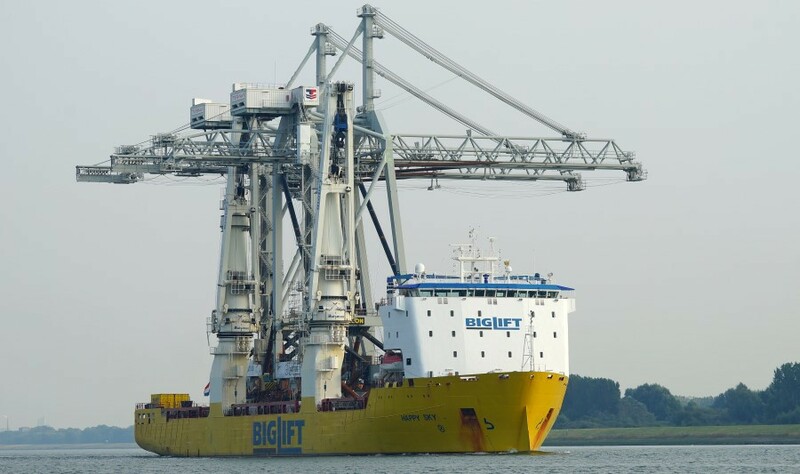 Happy Sky’s two 900 mt Heavy Lift Mast Cranes offer this quality, making her very suitable for the job. Furthermore, her excellent stability enables such loading and discharge operations to be achieved without the need for stability pontoons. In order to spread the forces on the vessel’s deck load spreaders were positioned on the weather deck. After lifting the first container crane on board it was skidded over pre-installed rails to its stowage position aft. 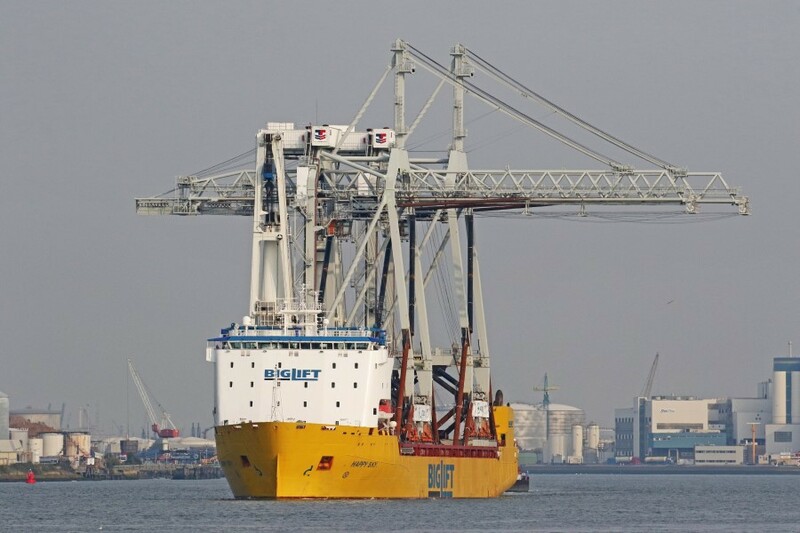 The vessel’s cranes positioned the second container crane directly in its stowage position. With the discharge operation successful completed, we trust the two STS cranes will serve the port of Vigo for many years to come.